Meets Federal & Provincial standards. Anyone working with or around hazardous materials is required by law to be WHMIS trained. This comprehensive WHMIS Online Certification program has been developed in accordance with the Hazardous Products Act for the training of persons who manufacture, work with or are ‘in proximity to’ hazardous materials in the workplace. Kevin M. Verified Buyer I really like using this site for my WHMIS training. Very easy to use and can do it at any time. Joseph M. Verified Buyer I found it to be quite fast and convenient, because you can do it online and get the certificate the same day by printing. Very helpful. Nicholas B. Verified Buyer User Friendly, simple and easy. Great way to get certified! Karen D. Verified Buyer I had difficulty in 2 areas of registration and your contact was very helpful in guiding me through the process. Much appreciated. Eric G. Verified Buyer Very accessible. Quick. Very detailed. Understandable. Lucas K. Verified Buyer Excellent on-line training and easy to navigate content. Very convienient certification for busy people. Printable certificate and permanent record of training issued upon completion. Hard-copy plastic wallet-sized certificates are also available. Average duration is 1 hour – 90 minutes. Train on your schedule, taking as much or as little time as you need. No time limit. Unlimited exam attempts. Live student support is available from our safety specialists and subject matter experts 7 days/week via phone, email, and live chat. Individual training and bulk user management tools include: progress reporting, access to past records of training and certificates, certification reporting/alerts, & much more. A sturdy plastic WHMIS 2015 Training certificate may also be purchased directly from the My Account page. These hard-copy certificates are printed on durable 0.30mm polycarbonate plastic. WHO IS REQUIRED TO HAVE WHMIS 2015 TRAINING? According to Canada’s Hazardous Product Act anyone who manufactures, works with, or is ‘in proximity’ to hazardous materials in the workplace must have WHMIS 2015 training. Hazardous materials include: compressed gases, flammable and combustible materials, oxidizing materials, poisonous or infectious materials, corrosive materials, or dangerously reactive materials. WHAT IS THE DIFFERENCE BETWEEN WHMIS 1988 AND WHMIS 2015? “Controlled products” are now classified as “Hazardous Products”. Hazard classes have been redefined and there are now more of them. Classification criteria have been updated to match global standards. Supplier labels have been updated to make them easier to read and contain more information. The WHMIS pictogram list has been expanded to include the Exploding Bomb, Health Hazard and the Exclamation Mark (Acute Toxicity) and has adopted universally accepted symbols for each hazard type. Material Safety Data Sheets (MSDS) have been re-named Safety Data Sheets (SDS) and have been expanded from 9 sections to 16 sections. Safety Data Sheets are no longer required to be updated every three years. WHAT TOPICS WILL BE COVERED IN GO SAFETY’S WHMIS CERTIFICATION TRAINING? HOW LONG WILL IT TAKE TO RECEIVE MY WHMIS CERTIFICATE? Your certificates will be available to you to download and print immediately upon completion of the final exam. Certificates are available as wall-sized 8.5 “x 11” diplomas and wallet-sized proof of training certificates. These certificates may be used as soon as they are printed and signed. Additional WHMIS workplace training information should also be added to your certificate. If you would like a plastic hard copy of your certificate dered via mail or courier, you can order one directly from the My Account page for a small charge to cover the cost of postage, printing, and fulfillment. HOW OFTEN DO I NEED TO RECERTIFY MY WHMIS TRAINING? Your training is required to be up to date at all times. See your employer’s health and safety policy for their recertification schedule. HOW LONG DO I HAVE TO COMPLETE MY WHMIS TRAINING? Although most students will complete their training in 1 – 1.5 hours, there is no time limit to complete your certification. Once completed, your training materials will remain accessible to you for review purposes. WILL THIS WHMIS 2015 COURSE WORK ON MY TABLET OR SMARTPHONE? 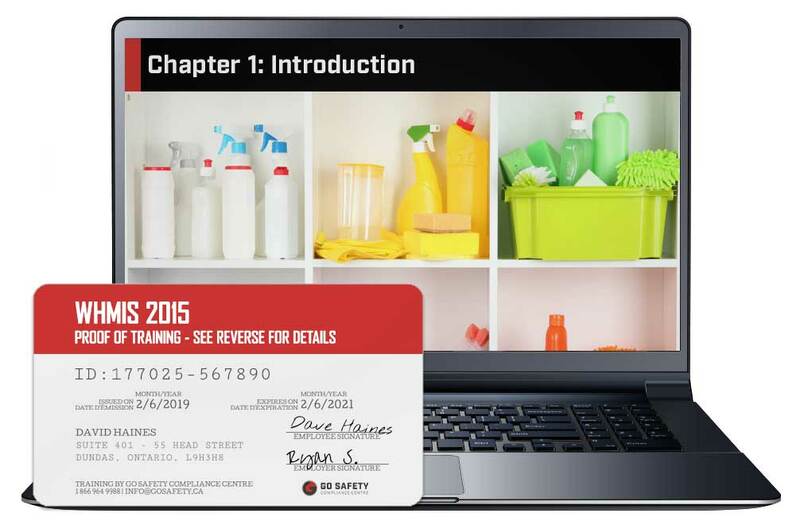 Go Safety’s WHMIS 2015 course has been developed to work on all major operating systems and web browsers. Your training may be taken on any personal computer/laptop as well as most tablets and smartphones. When you begin or continue your training on a mobile device, the website/application controls, and interface will automatically adjust for your screen size and controls will be optimized for your device. In the event of an interruption due to a loss of connectivity, your training will be paused. You may resume your training at any time by logging back into your account on any compatible device with an internet connection. Alternatively, offline training manuals may be used to self-certify. HOW CAN I ACCESS MY RECORD OF TRAINING? Your record of training is made available from your user account. This record is maintained by Go Safety indefinitely and is available for your review at any time. 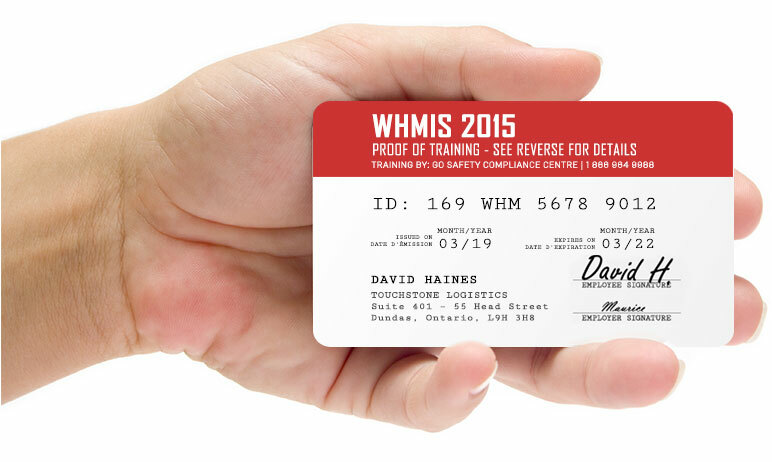 HOW CAN I PURCHASE A WALLET SIZED WHMIS 2015 TRAINING CERTIFICATE? CAN I PURCHASE TRAINING FOR SOMEONE ELSE? Training can be purchased for others, including workers, students, friends, etc… Simply purchase the required training course, and then assign it to a new user account after your purchase is complete. User accounts for other people can be created one at a time, in bulk, or through an automated system using training access codes. Access codes will automatically assign training to a user as well as assign their account to you. This will allow you to report on their training progress and certification status from your management panel.